Here's a brief postscript to yesterday's entry about Urban F. Diteman, the cowboy pilot. When Diteman disappeared forever in October 1929, he left a widow and two sons in Billings ... the younger boy was a four-year-old named Hall Drake Diteman. 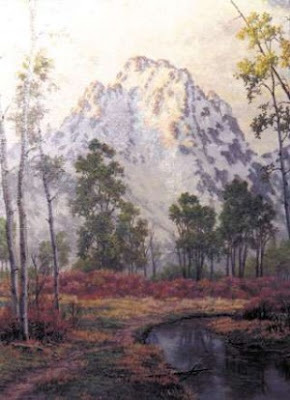 Hall ended up staying in Billings for the rest of his life, becoming a self-trained artist who trained in western landscapes and held annual exhibitions in his home. By the time of his death in January 2009 he'd become fairly well known in the western art community.